Anyone have any idea what the name of this plant is? I bought it probably 5 or 6 years ago at a little nursery in Austin that was on South First Street (it's since gone out of business). The man I bought it from didn't know what kind of plant it was but I didn't care because I thought it would look so good in one of two pots I was buying from him (they were such a deal, I couldn't pass them up). Over the years it really took off and became too big for the lovely pot. So I finally decided to plant it in the landscape. A month or so ago I worked on the soil, adding sand and gravel and building a mound so it would drain well (I'm always worried my xeric plants will drown in Louisiana rains!). But two weeks ago I discovered a hive of fire ants had thanklessly moved into my mound. The only organic control that I've found that works with them is to disturb their mound, put lots of diatomaceous earth on top, and then run away before getting stung. It worked and I was able to plant this today with the help of my husband. So if you can guess what plant this is, please give it a try as I'd really like to know. Thanks! As an aside, in this world of strange coincidences the man who sold me this plant grew up in the small town I live in today! 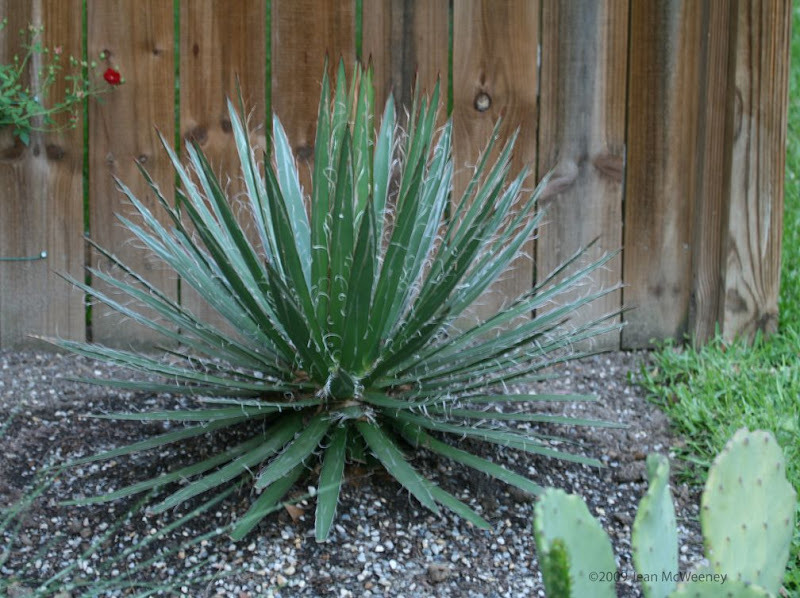 UPDATE: It has been identified as an Agave multilifera. Thank you Maria! My first thought was some kind of Yucca. Does it bloom? It looks like an Agave Multifilifera. They come from Mexico. It looks like it really adapted to your soil, they are usually found in the hot, dry, and arid soils of Mexico. Donna - it does look very much like a yucca but I've always had in the back of my mind that it was an agave. That's a beauty! I'll bet it'll be quite happy on the gravel mound. Good to know about the organic treatment of fire ants. I'll have to try that next time.